Ghee, or clarified butter is an age-old Indian food found in almost every Indian kitchen. “Fat” has been given a bad name by some nutritionists, but people have now slowly realized that “Ghee” is the healthiest fat there is! The benefits of ghee are innumerous. Pure and desi ghee shouldn’t be confused with artificially manufactured vegetable shortening or as it is known in India as “Dalda or Vanaspati”. Pure ghee is made from butter which has been churned from fresh cream sourced from cows. Ghee, being a rich source of antioxidants is also good for the baby’s growing immune system, protecting the child from diseases. Antioxidants will protect your baby from infections. Homemade ghee also helps the body to absorb fat-soluble vitamins like Vitamin A, Vitamin D, Vitamin E and Vitamin K. These vitamins are vital for well-rounded development and health of your baby. It is a well-known fact that the first two years are crucial for baby’s brain development. More than 50% of the brain is made up of fat. DHA or Docosahexaenoic acid is a healthy fat which is required for the brain development in babies and kids. One of the most important benefits of ghee is that it is a source of DHA, which should be a part of your child’s diet. Many families advocate using ghee for baby massage, while some say that it clogs the pores. The truth is that ghee protects the body from cold and helps to keep the baby’s skin soft and moisturized. So, do massage your baby with ghee daily in winters and sparingly in summers. Enjoy the benefits of ghee in many, many ways. One of the many benefits of ghee is that it is also anti-inflammatory in nature. Warm ghee can be used to relieve the thoracic cavity and reduce irritation caused by a dry cough. You can heat ghee with a little ginger and black pepper and give a small tablespoon of it to your baby twice a day. 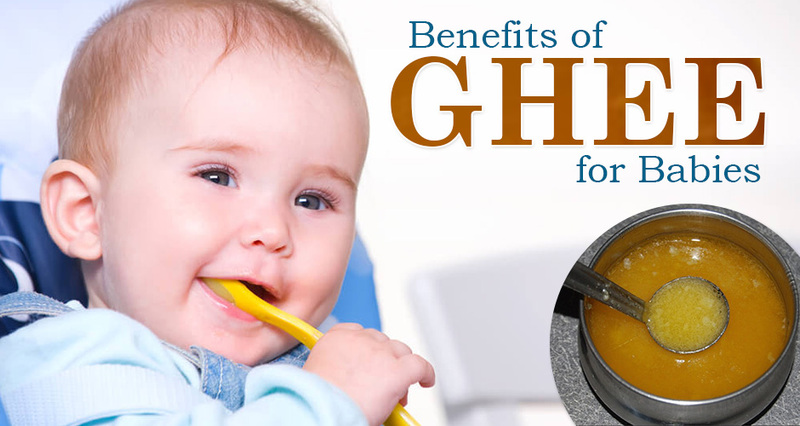 Ghee is a very good source of energy which babies need for growth during infancy. Babies are expected to triple their birth weight in one year. With most babies becoming physically active by crawling and walking by the age of one – they need a dense source of energy for wholesome development. Ghee is considered one of the healthiest fats precisely because it has a higher smoking point. This means that it doesn’t easily break down into free radicals. Excessive amounts of free radicals in your baby’s body can cause respiratory issues and other health problems. Unlike other fats present in red meat, ghee is a fat that is easily digestible. When parents look for a high energy source that won’t upset their baby’s tummy – they should consider ghee. Desi ghee is a fat rich, easy to digest food that is also high in calories – the perfect baby energizer. Put the butter in a thick bottomed iron kadai and cook it on medium heat. Slowly the butter will melt and milk solids will begin to separate and bubble up. Keep cooking on medium heating and stir in between as the foam will go down. Liquid from the butter will begin to reduce. Add the curry leaves if using and turn off the stove. Let the ghee cool down. Once cool strain it and store in a glass container. #1. Amount of Ghee for Your Baby. It is rightly said that anything is good in moderation and harmful in huge quantities. The same goes for ghee. Overburdening your little one’s digestive system by overloading him with ghee is not a very healthy way to go. Limit ghee to 2 tablespoons throughout the day, for your baby aged less than a year. #2. How Your Baby Reacts to it. Follow the three-day rule before feeding your baby anything! Same goes for ghee. If you are feeding ghee for the first time give a pea-sized quantity and observe your little one for 3 days. If there is no allergic reaction, slowly increase the quantity. #3. Always Prefer Homemade Ghee. As mentioned earlier please don’t confuse cow’s ghee with vanaspati or dalda. They are not a very healthy form of fat. Research has shown that such fat increases the risk of heart disease and Type 2 diabetes. 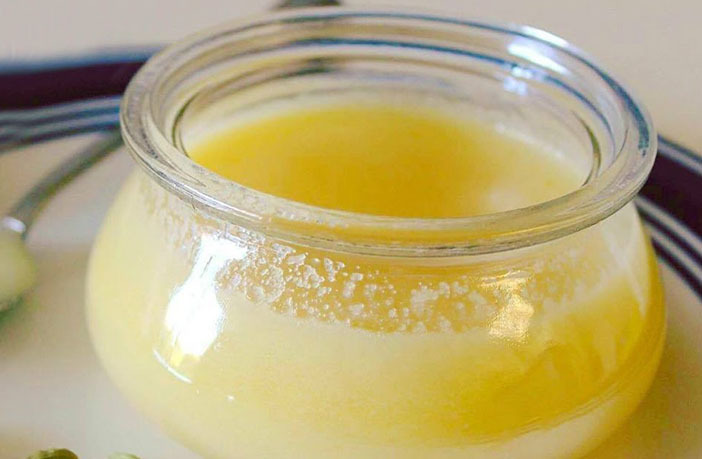 Homemade ghee is one of the healthiest sources of fat. It has many health benefits and should be a part of your child’s daily diet. Ghee should be given daily but always in moderation – so don’t be over enthusiastic and add more than a dollop. Do you give ghee to your little one? Did you know about these benefits of ghee before? How do you give ghee to your baby? Share below!